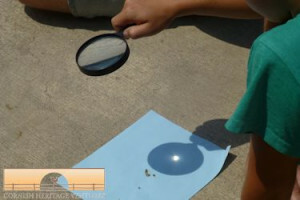 This year (yes we have started our new homeschool year) Daniel wanted to learn about space. Daniel is very much a kid who knows what he wants to learn for science and so we encourage that by providing him with the tools needed. (Last year it was the Titanic and snakes and in fact snakes are still very much on the agenda but Titanic is over.) 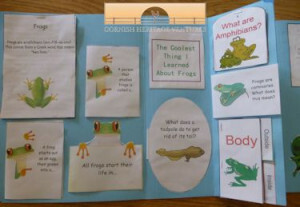 We purchased the Apologia Exploring Creation curriculum for him. 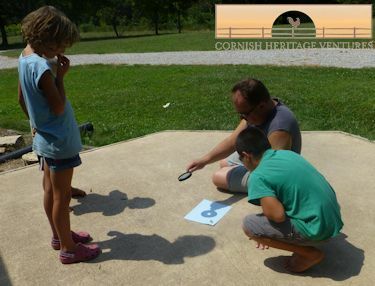 Recently he has been studying the sun and so today it was time for an experiment with Daddy to learn how to make fire with a magnifying glass! Great excitement but also a warning from Mom and Dad to never do this without adult supervision! It is very dry here right now and we certainly do not want to start a wildfire! Boys being boys, Daniel and Caleb are now out experimenting whilst Hannah has seen enough and is back inside! As Richard says, this experiment is also a good survival skill. It is a little smokey out there! I should also point out that it is important to wear sunglasses doing this as the concentration of the sun is very bright and could damage the eye. I am the first to admit that science is not my strong point. Yes I can read the text from a book and explain basic things to the children but that is as far as my ability goes. Richard, on the other hand, LOVES science and is really good at explaining the workings etc. We are so blessed that we compliment each other in this way in the homeschooling of the children. What’s your weakness? 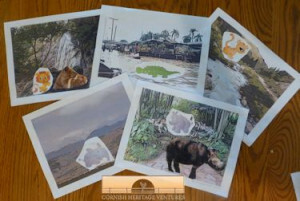 As a homeschooling mom/dad don’t be afraid of getting your other half involved. If you are both weak in a particular subject seek out help from an online class or someone in your community. Many of you may well be taking a break for the summer months. Our choice, as a family, is to homeschool all year around so that we can take off whenever we want PLUS we have found that our children do much better with a daily routine when we are home and don’t have “other” stuff going on. Even if you are taking a break, you may still have some days where the kids want to do some learning activities. Don’t refuse them! Willingness to want to learn is precious and should be encouraged. 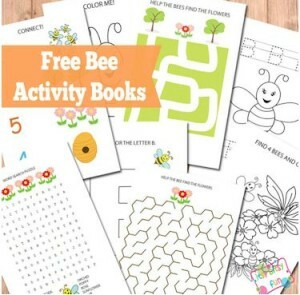 This will also keep their minds active so that you do not have to reteach everything once school starts up again! 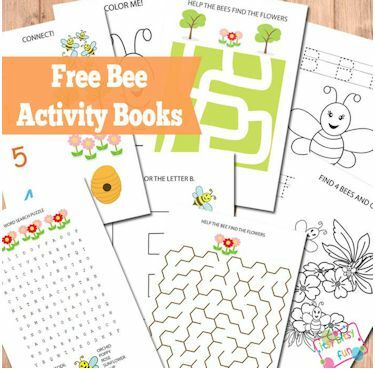 With that in mind, why not take a look at these FREE Bee Worksheets from Itsy Bitsy Fun. 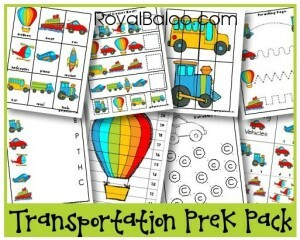 They are suitable for preschool through first grade. Just so you know, I did spot the spelling error (scrambeled instead of scrambled) but have checked the rest of the documents and they appear OK. Use it as a good opportunity to see if your child can see the misspelled word. 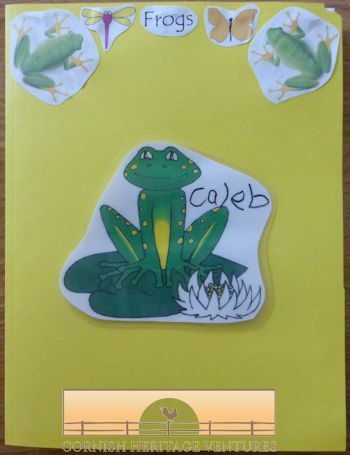 ‘Tis the season for frogs. 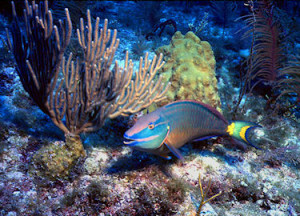 The air is alive with their singing both day and night. The kids have been out catching tadpoles and watching them grow, always putting them back in the pond when finished with their playing though. 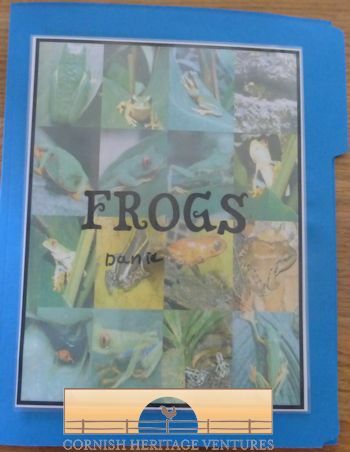 SO when I decided yesterday that today we were going to do something different and do a lapbook, the subject of frogs seemed to be an obvious one. As I looked in my newly cleaned up and freshly organized PDF files I discovered we had everything we needed. 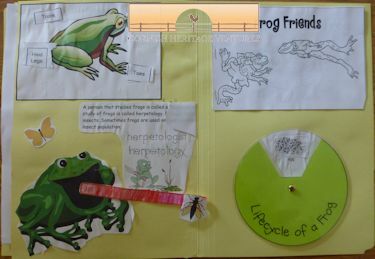 I pulled projects from several different ones to create the lapbooks you see on this page. 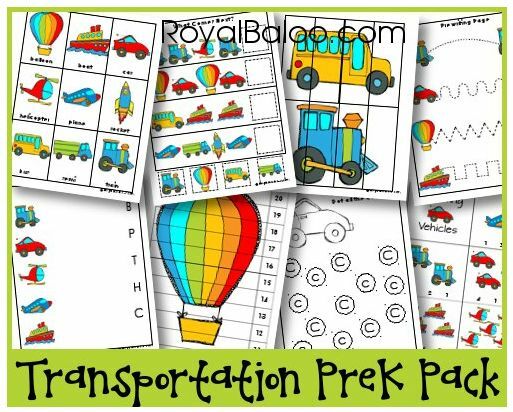 Daniel and Hannah both did the same ones but although Caleb could do some of the same, being only a preschooler he wasn’t going to do all the writing etc so I printed him off easier worksheets. All three of the kids work used two file folders each. I did not have time to plan them out last night so this morning when we just made three separate piles of their work as they finished each piece and then when they were out playing I put them together. That way, I had all the pieces and could place them efficiently in the folders. Daniel is a much neater worker than Hannah, hence showing his lapbook! 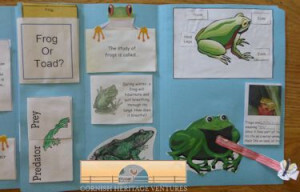 They all loved the frog catching the fly! 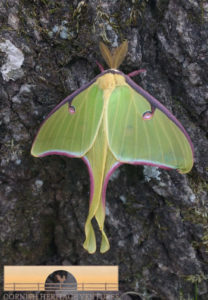 There were actually three insects to choose from but they all chose the fly for some reason and not the butterfly or dragonfly. We all learned something so definitely a worthwhile study. There are several pages under that first page on the left for Caleb. I figured this was the best way to store them. 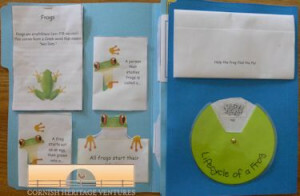 Frogs Express Lapbook by A Journey Through Learning You can also purchase direct through their website – check which is cheapest at time of ordering! We did not read any books with this study as for one thing, we have read many books on frogs before not to mention that the kids already knew the life cycle etc PLUS the info provided with the above units is pretty detailed. 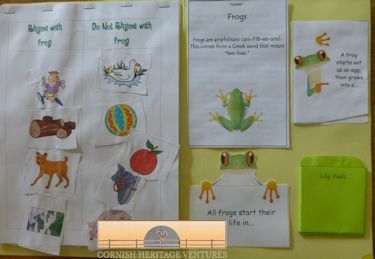 HOWEVER if your child is not that familiar with frogs or you are not close to where you can see ones developing etc I would recommend making use of your library for some great reading resources. 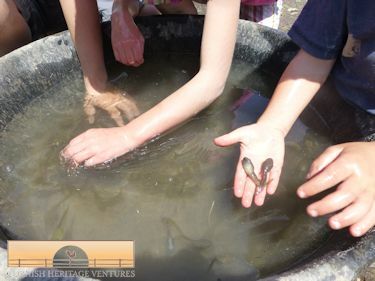 Here are the children playing with some bullfrog tadpoles of which there seems to be more this year than ever before. 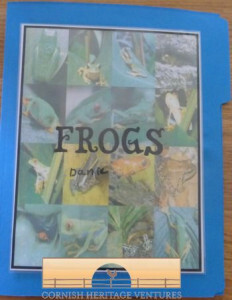 Take care and trust you enjoy studying frogs as much as we did! Royal Baloo recommends these for 2-4 year olds. 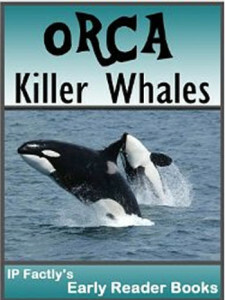 If you do not own the book you should be able to find it at your local library. If not, then you can purchase a copy very reasonably on Amazon. These are WONDERFUL! SO versatile and can be used for a wide variety of ages. Get ready to take a nature walk and see what you can find! You can find them here at Harrington Harmonies. I think I have shared this next link with you before but if you are looking for a good book for introducing insects then check out the FREE book on Gutenberg – The History of Insects. 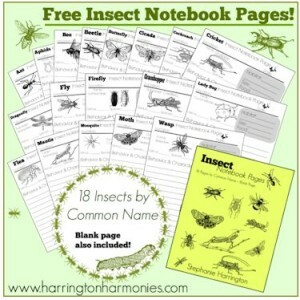 Also on Gutenberg is The Insect Folk by Margaret Warner Morley. 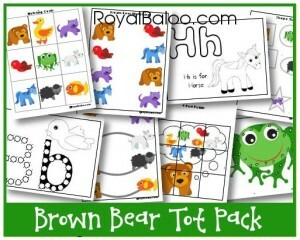 This fun pack from Royal Baloo is colorful, fun and engaging. Depending on the ability of your child you may find your 3 year old can do it. Otherwise give it to your 4 and 5 year olds and see what they can do!